I had so much fun reading all of your great comments last week on Dining Out. Thank you for playing along. If you check the poll almost half of those responding eat out once a week. That makes me happy to hear that you have found out life does not end when the foods you can eat change. I also loved the great tips. Thank you! Poll stays open so if you didn’t vote feel free to do so. Today I want to know: What is the best traditional gluten recipe you now make gluten free? What dish, meal, baked item, fried food or whatever do you continue to make now that you live gluten free? Did you take an old family recipe and convert it? Was it hard? How long did it take you to figure it out? Or, are you still struggling with converting that favorite? If so share what it is and I bet someone reading will have a good option. Mine, without a doubt, was my sausage stuffing for Thanksgiving. Oh I can smell it now just thinking about it. I think mine is also my acorn squash stuffing. My mom said it's the best stuffing she's ever had, gluten or not. I do have a sweet potato bread recipe though, that I have not been able to successfully convert to gluten free. I'll keep working on it though. Iris- Something about stuffing. You know I recently saw some type of sweet potato bread or muffin on Karina's Kitchen. You might want to check there for some ideas. Also, Ali's Whole Life Nutrition Kitchen and gluten free easily for more baking ideas. Let us know when you convert. Terina- Lucky you! So what are you going to do with all of those meatballs? Soups, pizzas, calzones, subs, top off spaghetti, the list is endless. What's your favorite? My old favorite cornbread is still very good with GF "flours" (starches) – especially when made with blue cornmeal. My college kids love to come home to it, despite it being safe for me! And all week, just for the 2 of us, I've been baking up ONE small tray of oatmeal raisin/choc chip cookies per evening – from the batter I made a week ago. I used GF oats and Jule's GF flour mix. The trick is – they never get old, because we make so few cookies at a time. My husband was still commenting last night, over the final batch, that they were so good, and that no one would know they were GF. 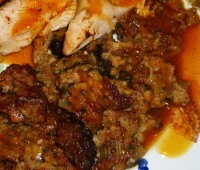 And about stuffing – I agree how well it converts! I don't have a specific recipe, but as long as I use my GF cornbread as the base, it is always delicious. My best success (judged by the gluten free and glutenicious friends & fam alike) for a converted recipe I think is for stuffed pasta like tortellini or ravioli. As far as converting a family favorite, I think I'd have to pick my family's beef stroganoff recipe – though it wasn't that hard to convert really :). Jenn- Wow, I'm coming over when you serve tortellini. I've decided this year I'm going to learn to make gluten and dairy free ravioli. I hope it works. If you have any tips for gf pasta making pass them along. Glad you tweeted about this, so I'd remember to come back to this post. I'd say that about 98% of what I've converted has been successful. I do have to tweak the raisin cookies I tried last week. Those suprised me. Texture and taste was great on the last batch, but not anything like the original gluten recipe. In this case, that's not a bad thing … the cookies tasted better! My most loved recipe is my brown sugar chocolate chip cookies. I never missed a beat with those. Even gf, they are preferred by all over gluten cookies. 🙂 I'm loving these thought-full posts, Diane … the dialogue you've got going and the encouragement offered! Shirley- I love how you work on those cookie recipes. It's so cool. Someday I'll get there. For now I'll just follow the recipes you gals come up with. I am very excited to see people share their opinions, experiences, encouragement and have these great conversations going. Love it! What a great community!!!! Glad you tweeted about this, so I'd remember to come back to this post. I'd say that about 98% of what I've converted has been successful. I do have to tweak the raisin cookies I tried last week. Those surprised me. Texture and taste was great on the last batch, but not anything like the original gluten recipe. In this case, that's not a bad thing … the cookies tasted better! My most loved recipe is my brown sugar chocolate chip cookies. I never missed a beat with those. Even gf, they are preferred by all over gluten cookies. 🙂 I'm loving these thought-full posts, Diane … the dialogue you've got going and the encouragement offered!